Malta — the little island with massive ambition — isn’t playing games when it comes to Eurovision 2019. X Factor Malta, which served as their 2019 selection, gifted Europe 18-year-old Michela — a fresh face with a big voice. Then came her song “Chameleon”, which set the fandom alight with its unique mix of reggaeton, dance hall and pop. The song comes from our friends at The Symphonix, who have secured Top 4 places during the last three editions of Eurovision. And now comes even more exciting news. Michela is working with noted choreographer Ambra Succi and the graphics geniuses at Front Pictures for her stage show in Tel Aviv. Ambra is well-known in Sweden for her work with Loreen on the choreography of “Euphoria” — perhaps the most iconic and most celebrated Eurovision performance of the modern era. From her quirky crab dance to the scooping motions of her arms to the memorable lift from a backing dancer who appeared out of nowhere, Ambra dreams up moves that matter. She was also responsible for Robin Stjernberg’s winning performance at Melodifestivalen 2013, and has served as the main choreographer on X-Factor Sweden and for countless musical theatre productions in Scandinavia. Michela’s music video for “Chameleon” includes every colour under the sun and shows her working a variety of editorial looks — inside the palazzo and in stunning natural landscapes. And it seems she’ll drop something as dynamic and eye-popping in Tel Aviv as she’ll work with the award-winning Front Pictures. They’re the graphic artists behind Ukraine’s Eurovision 2016 stage show. Jamala’s breaking beats song wasn’t an obvious winner prior to the contest. But owing partly to their iconic graphics — including that tree — they stormed to victory. More recently they created the amazing visuals for Pink’s performance of “Try” at the Brit Awards 2019. Americans will know their work from America’s Got Talent. Are you excited to see what Michela and her team have come up with? What kind of staging do you expect? Let us know in the comments box below! The song sounds like Fuego! It follows the same recipe (hire Swedish team) but i am curious to see Michela’s presence. In any case, this is a certain qualifier and a Top 10 result is almost on lock for Malta. Y’all speak as if Eleni invented a new genre with Fuego. Malta has a great chance this year. This song’s a banger and I’m here for it! Choreography and staging look like they’re being correctly cared for too! Michela’s vocals are undoubtedly good! Effect on the odds ? Malta is now 8th switching with Greece. Well to be honest it is Greece’s odds that are drifting :P.
Odds takes some time to react to an event. We will see tomorrow if Malta’s odds shorten or stay the same. I am anticipating a slight improvement. Huh. Alright. Then my expectations are VERY VERY high now. But the big difference is that Michela can sing. With good vocals Jana would have qualify. The main problem was not the staging. I predict she’ll end up 6th – 10th in the final. If this was Sweden or Russia, top 3 for sure. Malta and Cyprus both deserve to win more than anyone Its a huge opportunity to showcase our countries. We are not Sweden you know..
an opportunity to showcase what ? there’s literally not one single cypriot person in cyprus’ team, neither among the songwriters nor among the performers. y’all just gon showcase a bunch of swedish people. Seems to be reinforcing my theory that this may very well be a dark horse. Feel that many countries are really investing into great staging this year. Hopefully we’ll have really great performances in Tel Aviv. lol so now it will win esc? Ofcourse not, good song but far from amazing. And Michela seems to miss that something special. Could top top 7 if they get it right, but winning? Nope. Malta is spending money like never before. Most money spent was on Ira Losco ! A lot and a lot ! They did not say the whole the truth how much they have spent ! Cos it would be a scandal ! And the way they used and rejected people who worked hard for a long period of years … where dumped with no shame! Wow! i think that Malta is gonna Slay this year. Winning? Maybe.. But top 5 is possible! Give me fire, I’m a fighter. Give me hype, I’m hyped. Please don’t blow it Malta, you have a real chance with this one. And you can clearly hear that a sound effect was used on her voice (this shouldn’t even be allowed in my opinion). The invisible back-singers were doing most of the job. Going back to Malta, I hope they won’t make the mistake of letting Michela alone on stage. This a bop that needs backsingers dancers on stage. Jan was pregnant at the time. It was likely unexpected so it is probable that there wasn’t much else they could have done to make significant changes to the choreography they were planning on doing beyond what we eventually ended up seeing. I mean…can they win? Maybe. It’s catchy enough. Lord knows they’ve waited a long enough time for that first trophy. I doubt it personally, but hey, expect the unexpected. Looks like Malta knows that “Chameleon” is their best chance in years at winning and are doing everything they can to win. This feels like the first time they’ve really focused on an international-quality performance, not just throwing in whatever local talent they can muster. On one hand, it’s a pity because it’s always good to use local, but if Malta wins and hosts, they will no doubt find a role for every songwriter, producer and dancer on the islands. I hope there is some connect between all those talented artists. I mean, I hope the choreographer knows what the graphic artists doing, and vice versa. Robyn, can wiwibloggs publish a list of all stage directors, choreographers and graphic artists competing this year? I mean she came 12th… still better than Italy that year huh? Didn’t Malta qualify that year? They were also top ten by the juries so how exactly did they “crashed and burned”? I don’t know the situation that year, but I predict people were putting a big expectation on Ira. Surely, she qualified with being first with the juries and ninth with the televote. 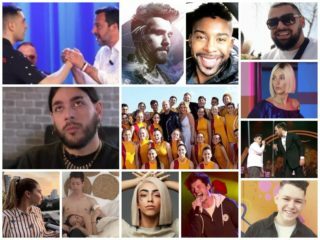 Malta ended up burning in the final, where they got fourth with the juries but sunk with being 21st with the televote–a strange occurrence. 16 points in televote on a €1 million budget is the definition of crashin n burnin. everyone expected malta to be much higher than 12th overall, let alone 21st with the public. In 2016, ira losco was going to use a massive coat projection in 7d. It was something that was never used before and also 3 years later we still are waiting for something like that. The problem was the SVT that failed to manage this new technology. If the plan works it is for sure that malta finished top 5. Chameleon is better than walk on water in my opinion. Also, chameleon is now 6th on the eurovision scoreboard app and still gaining votes. Malta really wanted to win. I hope Michela will serve us some great vocals and dancing. “Chameleon” is my favorite song from this year’s Eurovision. Count me in. I’ve been listening to it on repeat. This really gears up.for a shock win. Malta, Iceland, Cyprus are due for their first wins anyway, I would not mind seeing either of them to win. When life gives the budget, yes, I know, I’ll never save away, na na, just spend with me now. Give me budget I’m a spender.